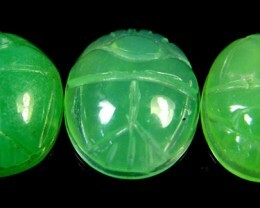 What is a Scarab and what does it mean? It is a representation or image of a beetle, much used among the ancient Egyptians as a symbol, seal, amulet or a gem hut to resemble a beetle. 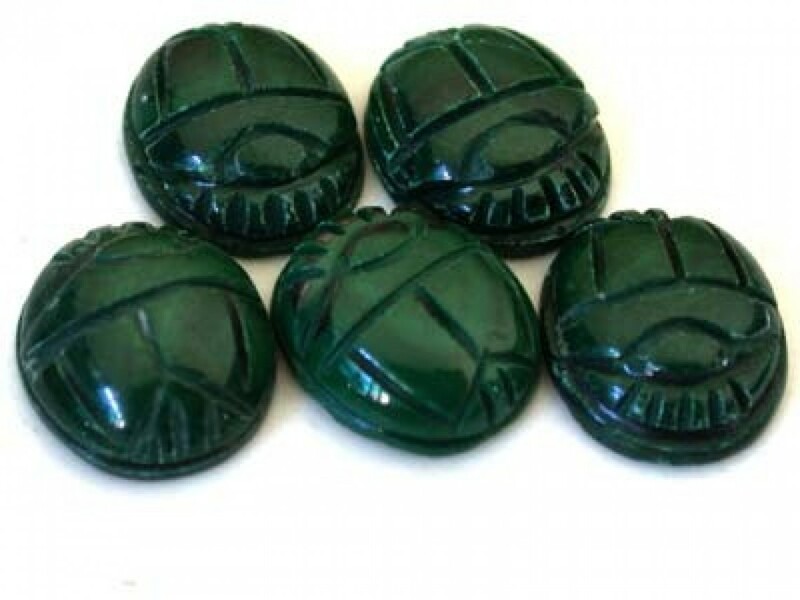 Scarabs are a common type of amulet, seal or ring bezel found in Egypt, Nubia and Syria from the 6th Dynasty until the Ptolemaih Period (2345-30 BC). The earliest were purely amulet and uninscribed: it was only during the Middle Kingdom (2055-1650 BC) that they were used as seals. 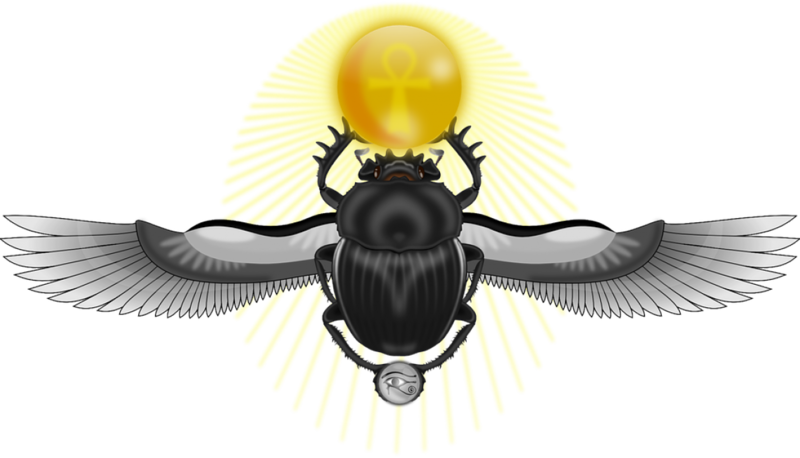 The scarab seal is so called because it was made in the shape of the sacred scarab beetle (scarabaeus sacer), which was personified by Khepri, a sun god associated with resurrection. 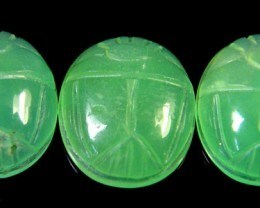 The flat underside of the scarab, carved in stone or moulded in faience or glass, was usually decorated with designs or inscriptions, sometimes incorporating a royal name. Scarabs, however, have proven to be an unreliable means of dating archaeological contexts since the royal name is often that of a long dead ruler; Menkheperra, the prename of Thutmose III (1479-1425 BC). During the reign of Amenhotep III (1390-1352 BC), a series of unusually large scarabs were produced to celebrate certain events or aspects of Amenhotep’s reign, from the hunting of bulls and lions to the listing of the titles of Queen Tiу. 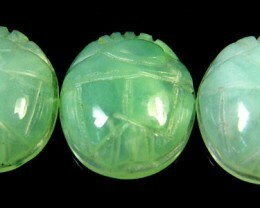 There were also a number of funerary types of scarabs such as the large winged scarab, virtually always made of blue faience and incorporated into the bead nets covering mummies, and the heart scarab, usually inscribed with Chapter 30B of the Book of the Dead which was included in burials from at least the 13th Dynasty (1795-1650 BC). 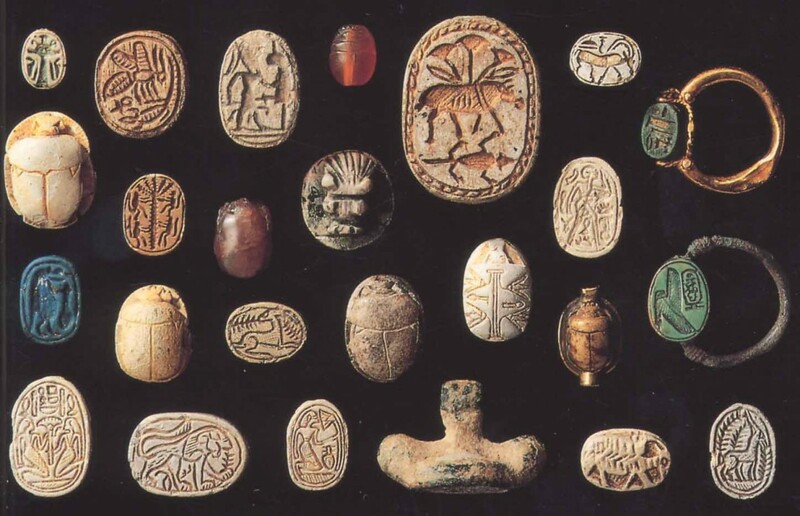 The term scaraboid is used to describe a seal or amulet, which has the same oval shape as a scarab but may have its back carved in the form of some creature other than the scarab beetle. This appears to have developed out of the practice of carving two-dimensional animal forms on the flat underside of the scarab. 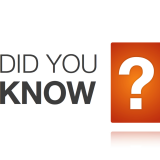 Tid period is know as the First Intermediate Period (2181-2055 BC). Finely carved scarabs were used as seals; inscribed scarabs were issued to commemorate important events or buried with mummies. 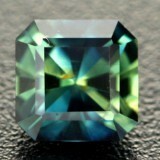 Lapis Luzauli was a mineral often used. Metamorphosed form of limestone, rich in the blue mineral lazulite, a complex felspathoid that is dark blue in color and often flecked with impurities of calcite, iron pyrites or gold. The Egyptians considered that its appearance imitated that of the heavens and considered it to be superior to all materials other than gold and silver. 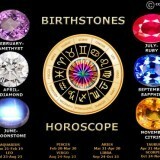 They used it extensively in jewelry until the Late Period (747-332 BC) when it was particularly popular for amulets. It was frequently described as “true” Khesbed to distinguish it from imitations made in faience or glass. 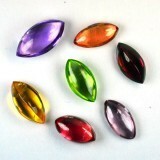 Its primary use was as inlay in jewelry and carved beads for necklaces. Scarabs have come a long way from shells and bones; it’s fascinating how the art of body adornment using decorative objects has evolved through time. 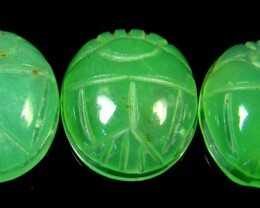 Scarabs serve many purposes other than to serve as mere decorations. 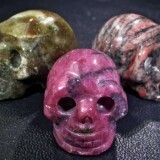 Over the ages, they have been used to symbolise wealth, used as currency, fashion accessory and also to serve as a form of artistic expression. 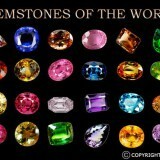 Precious metals and stones were used from very earl ages as a sign of wealth and opulence. Royalty have always used Scarabs as a means for securing and consolidating wealth and even to the present day, some of the most precious pieces of jewelry are antiques. 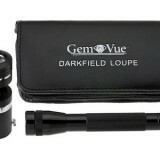 Royal jewels rank among the most expensive and luxurious assets of all times. 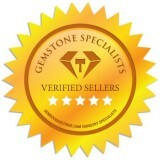 Man forms of jewelry that we use today have their genesis as purely functional pieces. Pins, brooches and buckles were initially created to serve specific practical purposes, but they later evolved into more decorative versions and began to be considered as jewelry for adornment. Jewelry has also been an important part in religion and social groups, to signify membership in a group and the status within. Over the history and religious beliefs surrounding the Scarab Symbol which was one of the most important religious Egyptian Symbols in the mythology of ancient Egypt. The scarab beetle was also called the dung beetle because of its practice of rolling a ball of dung across the ground which it then used as a food source. The Scarab beetle symbolised the sun because the ancient Egyptians saw a likeness between the scarab beetle rolling the dung and the sun god rolling the sun, making it shine on Earth. In ancient Egyptian religion the scarab was also a symbol of immortality, resurrection, transformation and protection much used in funerary art. The life of the scarab beetle revolved around the dung balls that the beetles consumed, laid their eggs in, and fed their young represented a cycle of rebirth. When the eggs hatched the scarab beetle would seem to appear from nowhere, making it a symbol of spontaneous creation, resurrection, and transformation. 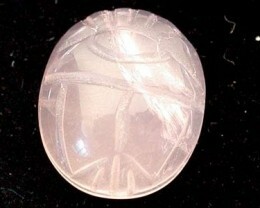 A scarab amulet provided the wearer with protection and confidence in the certain knowledge of reincarnation.